Readers Question: Why Does Inflation Make it Easier for Governments to pay back debt? Let’s assume an economy has 0% inflation, and people expect inflation to remain at 0%. Then let us assume the government needs to borrow £2bn by selling 30-year bonds worth £1,000 to the private sector. To attract people to buy bonds, the government may offer an interest rate of 2% a year. The government will then have to pay back the full amount of the bonds £1,000, plus the annual interest payments on these bonds (£20 a year at 2%). The investors who buy the bonds will make a profit. The bond yield (2%) is above the inflation rate. They get back their bonds plus the interest. However, suppose, unexpectedly there was inflation of 10%. This reduces the value of money. As prices go up because of inflation, £1,000 would buy a lower quantity of goods and services. Because of inflation, the government would get more tax revenue as wages and prices increase (e.g. if prices go up 10%, the governments VAT receipts will increase 10%), (if incomes increase 10%, income tax receipts will, roughly, increase 10%. Therefore, inflation helps government automatically get more tax revenue. Because of inflation, the government see its nominal tax revenues increase. The country isn’t better off, prices are just higher. However, bond holders lose out. The government still only have to pay back £1,000. But, inflation has reduced the value of that £1,000 bond (real value is now £900.) The inflation rate (10%) is higher than the interest rate (2%) on the bond, so they are losing the real value of their savings. Inflation means that repaying bond holders requires a smaller % of government total tax revenue – so it is easier for government to pay back. The Government (borrower) is better off, bond holders (savers) are worse off as a result of inflation. If people buy bonds expecting low inflation, but then lose their real value of savings because of high inflation, they will become reluctant to buy bonds because they know inflation can reduce the value of bond holders savings. If bond holders fear government may cause inflation, then they will want higher bond yields to compensate for the risk of losing money through inflation. Therefore the prospect of high inflation can make it more difficult for the government to borrow. Note: bond holders may not expect zero inflation, what damages bond holders is unexpected inflation. 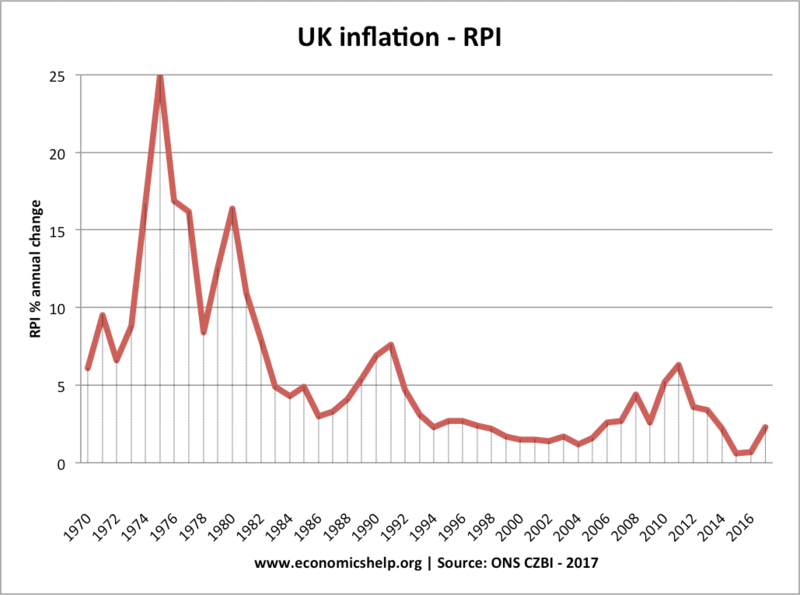 In the 1930s, inflation was very low. This is one reason why people were willing to buy UK government bonds at low interest rates (in the 1950s, national debt increased to over 230% of GDP). 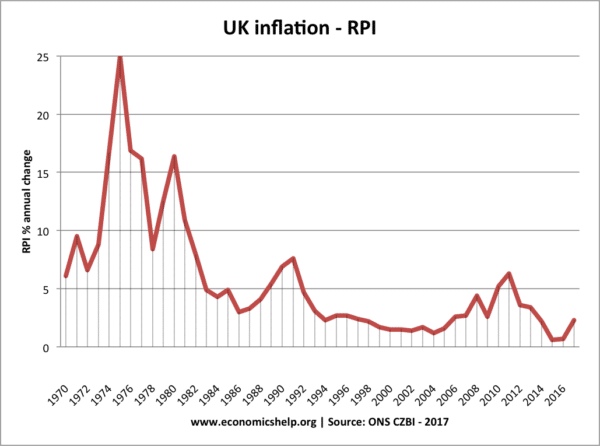 In the post war period, the debt burden was to some extent reduced by the effects of inflation which made it easier for government to meet its repayments. In the 1970s, unexpected inflation (from oil price shock) helped to reduce governments debt burden in various countries such as US. 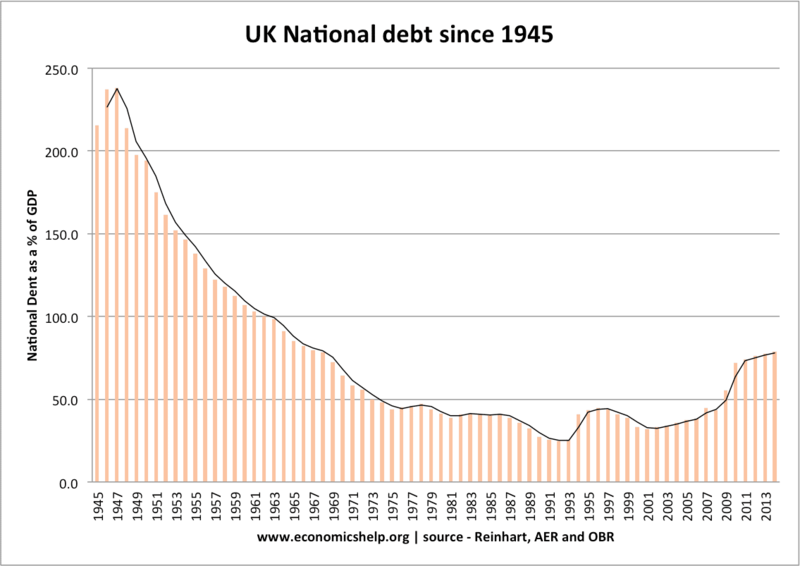 The fall in UK national debt as a % of GDP in the post-war period was partly accelerated by inflation – reducing the real burden of debt. Though debt also fell due to a prolonged period of economic growth and rising tax revenues. Another issue is that if the government reflate the economy (e.g. pursue quantitative easing) this may also stimulate economic activity as well as inflation. Higher GDP is a key factor in helping government gain more tax revenues to pay back debt. Bondholders may be nervous of an economy that is predicted to have deflation and negative economic growth. Although the real value bonds can increase with deflation, they may fear the economy is stagnating too much and so the government will struggle to meet its debt. 1. Why will wages increase with inflation? 2. “If prices increase, VAT receipts will also increase”. This is based on the assumption that the demand remains the same. However, with increase in prices, demand will fall. Am i right? Because inflation is essentially new money in the economy the prices goes up, but companies can payhigher salaries (and employees need more money to buy the same stuff so they demand it). Nominal prices goes up, but people can still afford the same. The difference is that government gets more taxes and can easily repai debts (and at the same time people with debts can more easily repay them with higher salaries and therefore afford to buy more). Don’t forget to mention that, although governments can pay back debt more easily, the value of all savings in the country is devaluated by the amount of inflation. If there is 10% inflation and your grandma has 1000£ in the bank, it is now able to purchase 900£ worth of goods. She essentially lost some of her savings in the process. Debtors in general (not only governments) are better off since the value of the nominal debt they contracted just went down 10%.